We had a repeat performance yesterday, with an inch of rain in an hour. I haven't seen rain like that since the Amazon. We got some sprinkles in Ukiah, and I hear that there was pretty hard rain in some places - but not that kind of rain. Down in Mexico I once timed the rise of water in the street. It took 3 minutes to go from a dry street to water reaching the top of a tall curb. An inch of rain in an hour is a LOT of rain! So you know tropical rain, too, huh? I'd have said there's nothing quite like it, but apparently temperate-zone rain is now like it, at least once in a while. Amazing. Wow, glad I'm not hiking up those stairs! In the winter here in California I guess there have been extreme rains in the past. 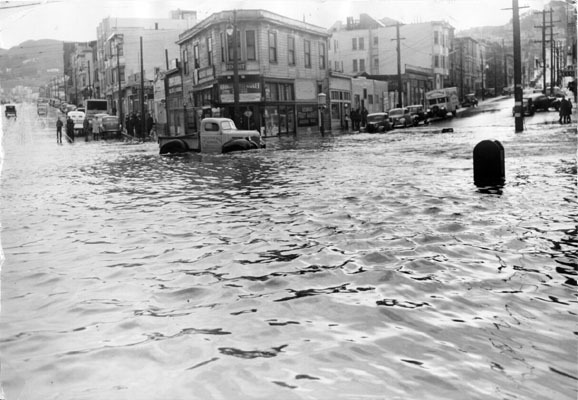 There is a picture of the intersection of Church and Market streets in 1941 where the intersection is under feet of water. This is the intersection that they are installing a vent in for the underground Muni tracks!!! Wow! I hope they evacuated the underground works. Municipal drainage in general has improved since then (I know the City of Portland has spent $1.2 billion on it in the last 20 years), so urban streets tend not to flood like that anymore. Which is to say, one more reason why we might not notice the extremes of weather even though they're probably getting more extreme. In general I agree with you. In this case I don't. The vent is new, supposed to be installed in the next month. This particular point is -the- collection point for an entire drainage area, and is in fact very close to where the water supply was for the Mission Dolores, the initial Spanish fort and church in San Francisco. Certainly this was a streambed before humans paved it over. 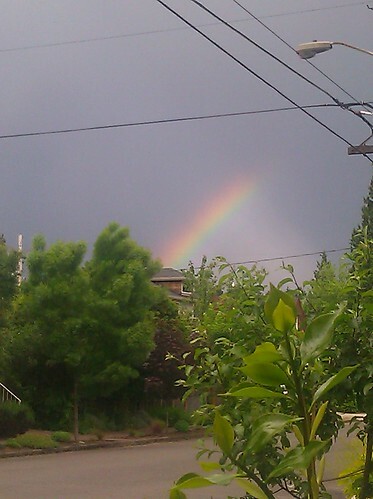 Well, for what it's worth, that rainbow grew and grew (and lasted a very long time in Rainbow Years) until it was finally arcing across a big chunk of the eastern sky. Speaking of rainbows, you might appreciate last week's New Yorker cover. I'm invariably looking for Meaning, too. I liked the "little engine that could" quality of a rainbow showing only a slice of itself against the odds of that dark sky. Oh, you know, I tend to be optimistic in general--often to the point of downright lunacy. That's amazing. How does that even happen? You know, that's a very good question, and a cursory google search didn't turn up an answer. It was quite striking, though, wasn't it?